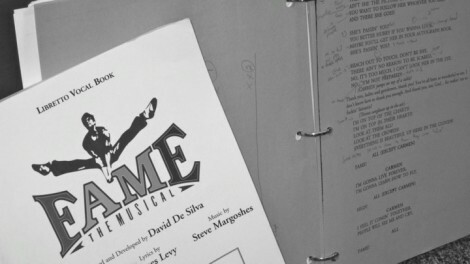 Even though drama teacher Richard Weingartner directed Fame the Musical in 1999, this years show will have its own personality. Despite a 13 year intermission and a new stage, when it comes to creating a production of Fame the Musical at Wayland High School, some things never change. This spring, the Wayland High School Theatre Ensemble (WHSTE) will perform Fame for the second time. Fame was performed at WHS in 1999 under the direction of Richard Weingartner, WHS’s drama teacher. Although he had worked on this play before, Weingartner still approached it the same way he would approach any other show. His strategy was to direct the production as if he were seeing the show for the first time. The students performing in the current production of Fame perceive the show in a similar way as the actors from the ’99 production. However, the two productions of Fame are far from identical. “In 1999, I tried to create an environment which was a lot more like that of the High School of Performing Arts. I was looking at the story with a little bit more realism. Now, it’s more stylized; I’m not going for it to be realistic or naturalistic,” said Weingartner. Rachel Barker, a teacher at Wayland Middle School, is a choreographer for the current Fame production. Barker provides a unique perspective as a former WHS student who worked on the show in ‘99. Barker and fellow choreographer and ’99 cast member Misha Chowdry have added one of the original eight dance numbers into this years’ production. However, some things have changed since Barker was a student. “We didn’t have a lot of techniques Mr. Weingartner uses now, which he developed after I graduated. However, I see the same stuff too — character bodies, gestures. I see the same homework going into each character,” said Barker. This year’s production of Fame the Musical will be performed April 25-28.